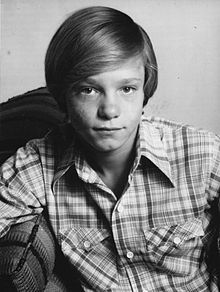 Lance Kerwin (born November 6, 1960) is a former American actor, known primarily for roles in television and film during his childhood and teen years in the 1970s. He played lead roles in the TV series James at 15, and the made-for-TV films The Loneliest Runner and Salem's Lot. Lance Kerwin currently sells timeshares with Wyndham Hotels and Resorts and lives on the island of Kauai, Hawaii. He was raised in Lake Elsinore, California. Kerwin's father was an acting coach, who brought home scripts for his son to read. His mother was also a performer and later, a talent agent. He is the youngest of five brothers. His brother Shane was his stand-in. In the 1970s, Kerwin appeared in a number of made-for-TV movies and series. He was, said former theater critic and British Film Institute governor John Holmstrom, "probably America's leading boy actor of the late Seventies ... a handsome teenager ... [with] considerable sensitivity as an actor". His serious acting roles often portrayed anguished characters facing difficult challenges, such as in The Loneliest Runner, The Boy Who Drank Too Much, and Children of Divorce. Kerwin has a daughter, Savanah Paige, with Kristen Lansdale and four children with his wife Yvonne: daughters Trinity, Terah, and Kailani, and son Justus Joe. He gave up acting in the mid-1990s and worked as a minister with U-Turn For Christ in Kaua'i, Hawaii." In July 2010, Kerwin and his wife Yvonne pled guilty to falsifying documents to obtain state medical assistance in Hawaii. Kerwin was sentenced to five years of probation and 300 hours of community service. Kerwin publicly apologized. ^ a b "Lance is 'Off And-Running" The Robesonian (Lumberton, N.C.) January 15, 1977 p. 10. ^ Holmstrom, John (1996). The Moving Picture Boy: An International Encyclopaedia from 1895 to 1995. Norwich, UK: Michael Russell. pp. 328–329. ISBN 0859551784. ^ a b "Former 'James at 15' star Lance Kerwin sentenced". huffingtonpost.com. This page was last edited on 7 April 2019, at 01:26 (UTC).